Mix 'n Match four of our lights. The one-piece design is water resistant and allows for easy installation as an entirely standalone HID unit. With its INTERNAL BALLAST simply connect the power and ground connections and bolt it into place to any half inch hole via a threaded bolt on the bottom. Buy a 4-pack Mix and Match package and save $100! 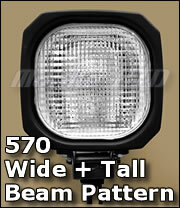 Save even more by ordering a 500 series light package! 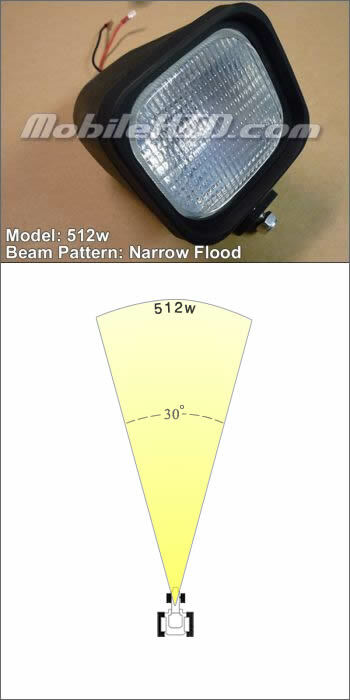 Our 400 series HID flood light is not like most flood lights. It's SMART! Most flood lights shine light everywhere and including the sky. Our 400 series flood light redirects the top 15% of the flood beam pattern back down to be redistributed around your work area. 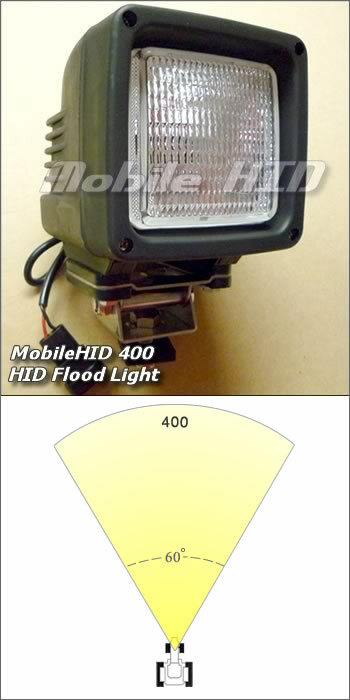 This helps maximize the usable light and makes our HID 400 series light "brighter" than other HID flood lights! The 60 degree beam pattern is not our widest because the beam pattern also needs to direct a lot of light down onto the ground. 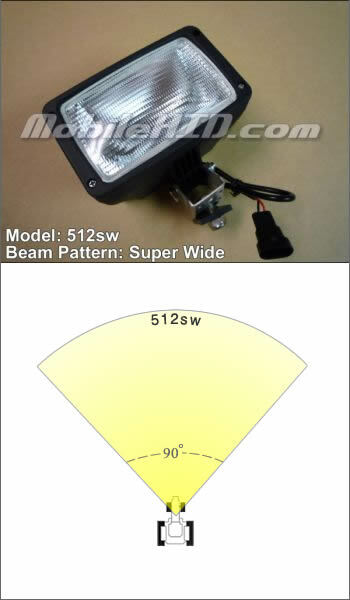 Our widest beam light is our 512sw light. Dimensions: 4 1/2" wide, 4 7/8" deep, and 5 7/8" tall from the mounting point to the top of the light housing. The 512 SUPERWIDE has a wide beam pattern that allows you to mount one on each corner of your machine and light up the area nearly 360 degrees around you. They can be mounted on any vehicle and is best for lighting up wide areas. The one-piece design has an INTERNAL BALLAST to ensure an easy installation. Connect it to 12v or 24v machines and simply bolt it in place. 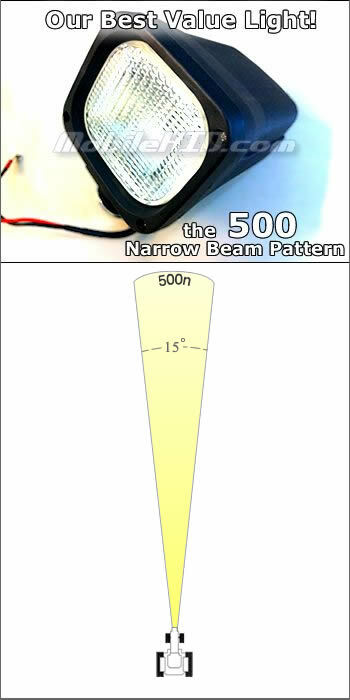 At a 10ft distance, the 512sw beam pattern will open up to 22-24ft wide. 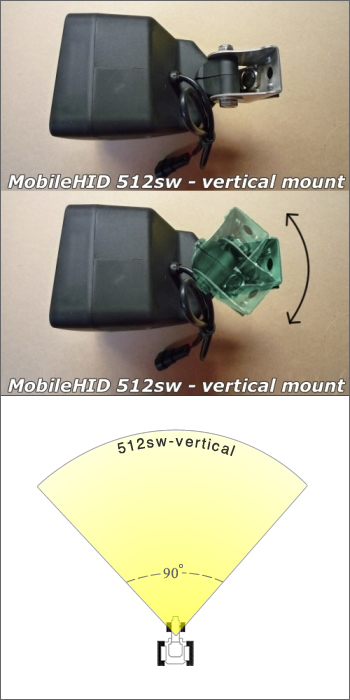 Dimensions: 6" wide, 4.25" deep, 5" tall from mounting point to top of light housing. Best thing we ever bought. We put them on two tractors and sprayer. The combines we use have two HID lights on top of the cab that are about 6"x8" and they're $700 a piece. 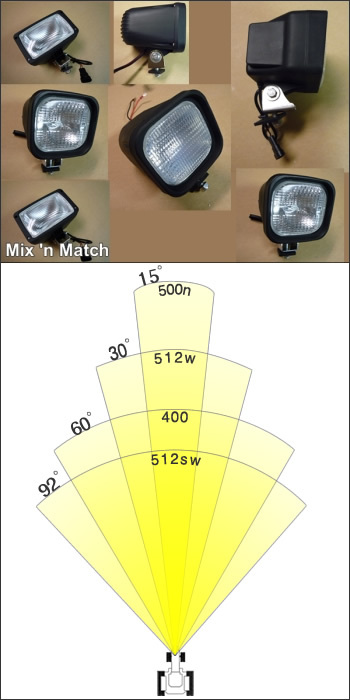 These 512sw lights are brighter and a ton more affordable. The 512sw-v (vertical mount) has a wide beam pattern that allows you to mount one on each corner of your machine and light up the area nearly 360 degrees around you. They can be mounted on any vehicle and is best for lighting up wide areas. At a 10ft distance, the 512sw-v beam pattern will open up to 22-24ft wide. Dimensions 6" wide, 5 1/2" deep from mounting point to lens, 3 1/2" tall. 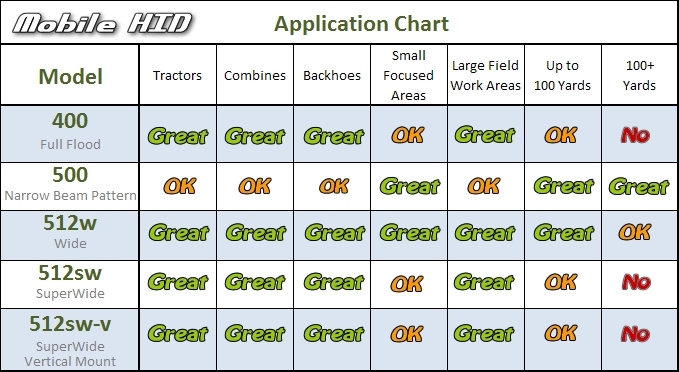 The 512w has a trapezoid beam pattern that most customers use on the front of their machines. They throw a majority of their light straight ahead but open up in the distance so you can still see off to the sides. 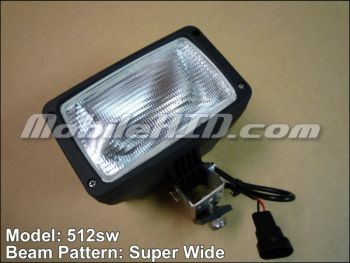 They can be mounted on any vehicle and is best for lighting up wide areas. Dimensions 5" wide, 6" deep, 6" tall from mounting point to top of light housing. Not sure which light to get? The 570 is a compromise between the 512sw and the 512w. It has a wide and tall beam pattern in the shape of a "+" sign that allows you to illuminate long distances with a wide beam pattern. They can be mounted on any vehicle and will need a larger space since they are larger than the 512sw and 512w. A great compromise between a 512sw and 512w light. Dimensions: 5.7" wide, 6.75" deep, 7" tall from mounting point to top of light housing.